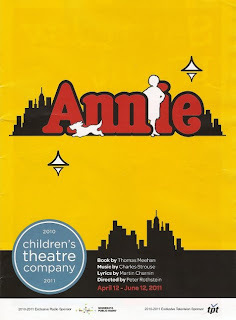 You don't have to bring a child when you go to the Children's Theatre (especially when the show is the classic Annie directed by the prolific and talented local director Peter Rothstein), but it helps. So I recruited my 12-year-old cousin (and her mom) to go with me. I had never seen Annie on stage, just the movie version. It's a truly joyous event, fun for kids and adults alike. Of course the star of the show is Annie, and newcomer Megan Fischer (cast through an open audition at the Mall of America) does an amazing job with the role. She's tough and tender, and has a beautiful strong voice. But Annie is also a really wonderful ensemble show, and this strong ensemble (made up of CTC regulars and faves from other local theaters) sings and plays together beautifully. Standouts among the cast include Lee Mark Nelson (so heart-breakingly good in Master Butchers Singing Club at the Guthrie last fall) as Daddy Warbucks, transforming from the gruff and serious businessman to a father in love with his new daughter. The comic relief is provided by the hilarious Angela Timberman as Miss Hannigan, Reed Sigmund as her brother Rooster, and Autumn Ness as his girlfriend Lily St. Regis (there's some really gross gum-exchanging going on between the two of them!). Reed is almost over the top in his portrayal of Rooster, but it works. "Easy Street" is one of the highlights, and Miss Hannigan cracked me up every time she called Ms. St. Regis, "you dumb ho ... tel." In addition to Annie, there are a half dozen young girls playing orphans, and they're all adorable and funny and talented (I particularly enjoyed the "Oh my goodness!" girl). I've said this before about child actors - I'm always so surprised at their talent, but really, kids are much more in tune with their creative, imaginative side than most adults are, so it shouldn't be surprising that they're good actors. Still, it's impressive what they do at such a young age (and while still in school!). The orphans also do a lot of the work of moving set pieces around, which seems natural to the story since mean Miss Hannigan makes them work all day. In addition to the beautiful ballads "Tomorrow" and "Maybe," and anything the orphans sing (is there anything cuter than a bunch of little girls singing and dancing their hearts out? ), I really enjoyed the ensemble songs "N.Y.C" and "I Think I'm Gonna Like It Here." A lot of people moving around the stage in organized chaos (delightful choreography by Michael Matthew Ferrell). Another highlight is the Annie/Warbucks duet "I Don't Need Anything But You," showcasing the great chemistry between Megan and Mark. The show has been extended another two weeks through June 19, so you still have time to see it. Bring a child if you have one. Or go by yourself if you don't; there's no shame in an adult going to a children's theater when it's this good! Sitting right in front of me was the director of the show (and Artistic Director of my favorite theater, Theater Latte Da), Peter Rothstein! I spoke to him for a few moments before the show and told him how much I enjoy his work (I had just seen Latte Da's Steerage Song the night before). He said he hadn't seen the show since the first week because he was in Seattle directing the 5th Avenue Theatre/Ordway production of Guys and Dolls (playing June 16-26 at the Ordway). It was a pleasure to talk to someone whose career I so much admire and enjoy!